Our own design, this robust pewter badge pin is cast for us in the UK. It's a bold way to show your status and pride as a Law Enforcement officer. It will work as both a cap badge or a kilt pin. Be sure to check out our matching Law Enforcement kilt belt buckle! 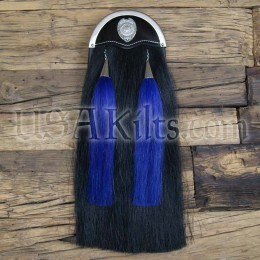 Ideal for a piper's uniform or honor guard uniform. - Measures 1.5" x 2"